The game of chess is thought to have originated in what is now northern India or Afganistan sometime before 6OO AD: the oldest written references to chess date from then, but there are unverified claims that chess existed as early as 100 AD. The KING at the right is part of a set of pieces dating from about 1200 AD found in a robbers' stash on the Isle of Lewis, northeast of Scotland. Interest in chess followed early trade routes out of India. One variation of chess (called Shogi) is now popular in Japan; another variation is played in China. Many local variations in chess rules persist even today in isolated rural areas, for example in India. The variation familiar to Europeans and Americans traveled through Iran (Persia) to the main commercial centers of Italy and Spain by about 1000 AD. A bit later, sea-faring Vikings carried the game into Scandinavia and Iceland. By 1100-1200 AD, the game became known in central Europe, and was well-established across all of Europe by 1400 AD, with the game rules which we use today. However, Russia's dominance of chess is recent, dating from the communist revolution of 1917, after which government schools for talented chess players were established. The modern design of chess pieces, such as those offered for sale from USCF at the beginning of this semester, bears the name Staunton, who was an English master in the mid-18OO's. It is now used in all tournaments worldwide. The first international chess tournament was the London Tourney of 1851, won by Adolf Anderssen of Germany, who then became known UNOFFICIALLY as the world's best chess player, though he did not receive any award or title. 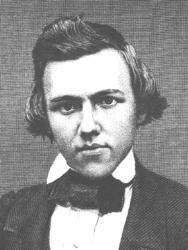 The first top-ranked American-born chess player was Paul Morphy, of Irish ancestry, who lived in the civil war era. He travelled to Europe in the 185O's, beating all challengers, including Adolf Anderssen. However, the English champion of the time (Staunton) refused to play, so Morphy never became a world chess champ. The first OFFICIAL championship chess tournament was played in 1866, also in London, with sandclocks to restrict the length of a game. This tournament was won by Steinitz, a Bohemian (Czechoslovakian) Jew, who then became the world's first OFFICIAL chess champion, holding this title until 1894. Emanuel Lasker, an American born in Germany, also Jewish, became champion by defeating Steinitz, remaining champion until 1921, at which time Jose Capablanca, a Cuban, took the title until 1927. Many people today consider Capablanca as one of the top 3 chess players who ever lived, the others being Morphy and Bobby Fischer. 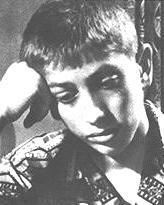 Shown at the right at about age 14, when he became US champion, Fischer was the first native-born U.S. citizen to have held the title of World Chess Champ. However. Fischer irritated the US government in 1972 by playing another former world champion (Boris Spassky) in Belgrade, Yugoslavia, and his US passport was revoked. Eventually, Fischer was granted citizenship in Iceland, where he died in 2008. Since 1927, many top-ranked chess players of the last 50 yearshave been citizens of the former USSR, and include: Tal, Alekhine, Petrosian, Spassky, Smyslov, Anatoli Karpov, and Gary Kasparov (last two at right). A dispute over tournament procedures between Kasparov and the international chess organization F.I.D.E. 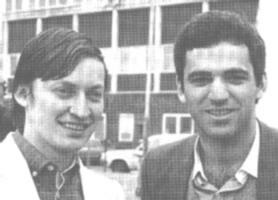 resulted effectively in TWO World co-champions: Karpov and Kasparov. American Ben Franklin was a well-known but not particularly good chess player. 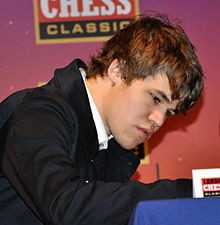 Recently, however, Magnus Carlsen of Norway (at the left) has won the F.I.D.E. championship and is seen by most as the world's chess champ. Our guest lecturer (probably Prof. Drucker of Math) will discuss these items and others.